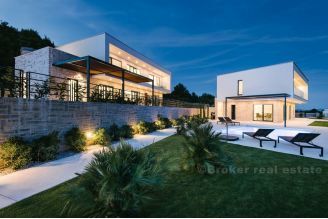 Modern luxury villa, under construction, in the vicinity of Rogoznica, 80 m (third row) from the sea, with a living surface of 250 sqm situated on two floors and 600 sqm large garden which provide beautiful open seaview onto west. 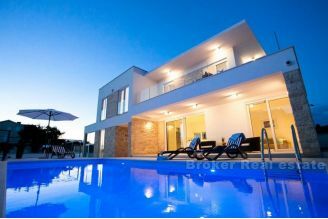 It consists of ground and first floor (4 bedrooms with bathrooms), basement garage, a large swimming pool. 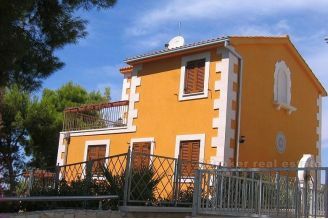 In the basement is a garage for 4 cars 35 sqm, pool room 4 sqm, shower 2 sqm, the fitness room of 40 sqm with sauna 2 sqm, laundry 6 sqm, hall and terrace of 20 sqm. On the ground floor; in front of the villa is a large pool of 65 sqm with swimming pool area of 70 sqm, kitchen and living room of 46 sqm, terrace 45 sqm, toilet 3 sqm, hall. On the 1st floor; bedroom 15 sqm with bathroom 6 sqm and loggia 9 sqm, bedroom 18 sqm with bath 7 sqm and loggia 10 sqm, 11 sqm bedroom with a bathroom of 5 sqm, bedroom 12 sqm with a bathroom 5 sqm, hall 15 sqm. 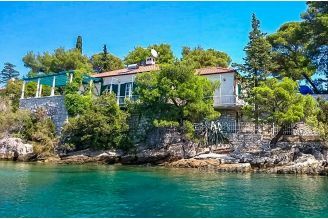 Fine decorated green space in front of the house is the ideal place to enjoy during the summer months with a nice breeze and a beautiful view of the sea. 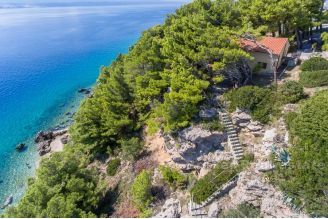 Secured private access to the beach and the sea directly from the plot. -phase with finished facade, all grounding, air-condition preparations, with done of most electric works, with done all construction works, dividing walls, hydro-isolation, water connection, and outdoor fire place. This phase will be finished until May 2017, and price of property will be 480 000eur. Price for completely finished villa without furniture, is 750 000eur.